Rich Frank, former president of Disney Studios and owner of Napa Valley-based Frank Family Vineyards, can add grill-master to his title. 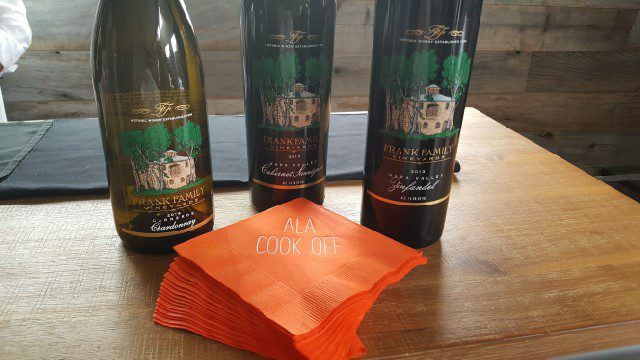 Recently in Los Angeles, where Frank currently splits his time with Napa, Frank not only poured his wines but he got behind the grill in a cook-off to raise money for Affordable Living for the Aging. Affordable Living for the Aging, founded in 1978, is a nonprofit dedicated to assisting homeless and low-income seniors. Los Angeles has a chronic homelessness problem. While there are various programs throughout the city that are dedicated to helping the homeless, ALA focuses exclusively on seniors. According to the ALA website, one-third of Los Angeles’ 1.2 million older adults are don’t have reliable housing today. That number is expected to double in 10 years. “Los Angeles is facing a crisis with our homeless populations,” explained ALA President and CEO David Grunwald. “This is work that needs to be done. We do not realize how many elderly need homes. ALA supports seniors who range along the spectrum of homelessness, from the at-risk to the chronically homeless with a range of programs. Frank, a supporter of ALA, had a running joke with Grunwald that the other is a better griller. Eventually they decided to challenge each other. The heated cook-off was turned into a charity cook-off fundraiser to benefit Affordable Living for the Aging. But the real winner is the elderly. Elderly people have so much to give. Some of those who have benefited from ALA were volunteering at the fundraising event that took place at a private home. More than $30,000 was raised to help seniors will be safe, secure and able to live productive lives. “ALA is really fortunate to have chef Stuart and Rich Frank helping to raise awareness for our cause,” Grunwald said.